It looks like some sort of televangelist laying-on-hands event. John seems to want more out the relationship than George does. 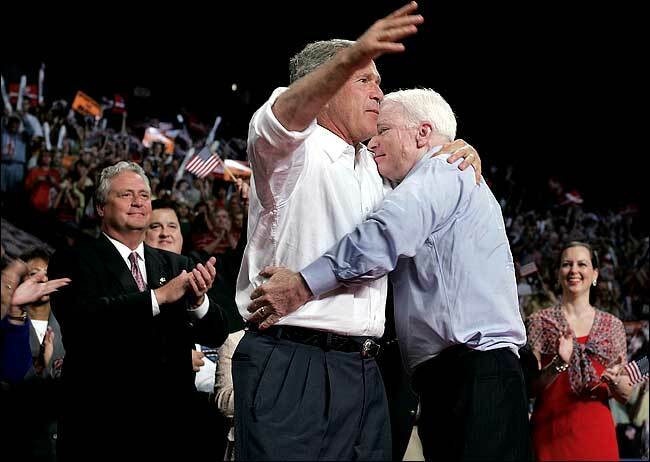 I don't know about that; McCain appears to me to have a bit of a gritted-teeth thing goin' on. Joe Scarborough was in the crowd cheering for Bush. He hosts a political show on MSNBC. I don't think he would consider himself a journalist, but something still seems wrong with that. You offer no proof. I will continue to give Scarborough and MSNBC the benefit of the doubt as well as assume that the media is indeed pervasively liberal. How are you liking my ZAP impersonations? I was in the audience at that event in Pensacola, FL yesterday. Scarborough was there primarily because he is a former Congressman representing Pensacola. He is a notable figure in the Pensacola community. Sure, he was supporting Bush, but I think he was there more because of his ties in the community. It wasn't a community gathering; it was a partisan assembly for which you must have tickets. I didn't say it was a community gathering. I know you had to have tickets to attend. What I was saying was that Scarborough was only there because it was a rally in Pensacola. If it were in Tallahassee he wouldn't have been there.